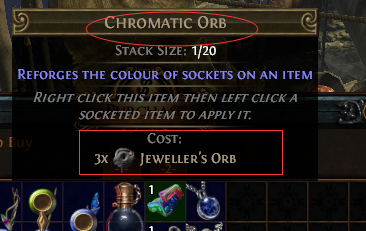 Chromatic Orb is the currency in the path of exile that re-roll the color of sockets on an item. A socket may have one of the four colors: red, blue, green, and white. The re-roll manner is not random but reforges the color according to the attributes of the equipment. Specifically, red sockets associated with strength, blue associated with intelligence, and green associated with dexterity. Chromatic Orb can reforge red, blue or green sockets, while Vaal Orb re-roll the white sockets. (1) Using Chromatic Orb vendor recipe: vendor an item with one socket of each color (red, green, blue) linked together. (3) Farming Chromatic Orb by slain monsters, open chests, and strongboxes. (5) Purchase 800 Chromatic Orbs for $1.76 additional 3% off with coupon “AOE”. Vendor recipe is the best ways to farm Chromatic Orbs. One can also acquire it by slain monsters, purchase from the vendor, buy from seller, trade PoE currency and items for Chromatic Orbs as well. This is the simplest way to farm hundreds of Chromatic Orbs. When level character up to 2, one can farm Chromatic Orbs by kill mobs directly. However, picking up items with socketed linked with red, green and blue is the best strategy. Chromatic Orb also has a downgrade vendor recipe. 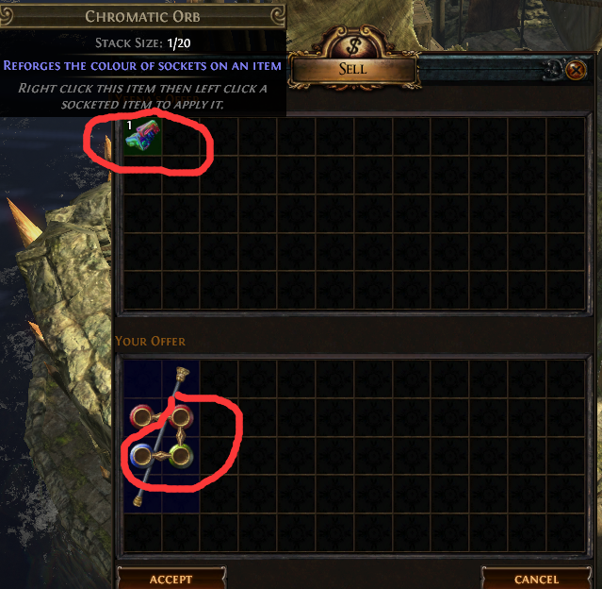 In the market, a Chaos Orb can exchange 2 Orbs of Fusing, or 11 Chromatic Orbs. Meanwhile, trade a Chaos Orb for 8 Jeweller’s Orbs. Therefore, this recipe does a sharp penalty. Yeena lives in The Forest Encampment in Act 2, sell a Chromatic Orb for 3 Jeweller’s Orbs. If you want to exchange lots of Chromatic Orbs, trade with other players is recommended. 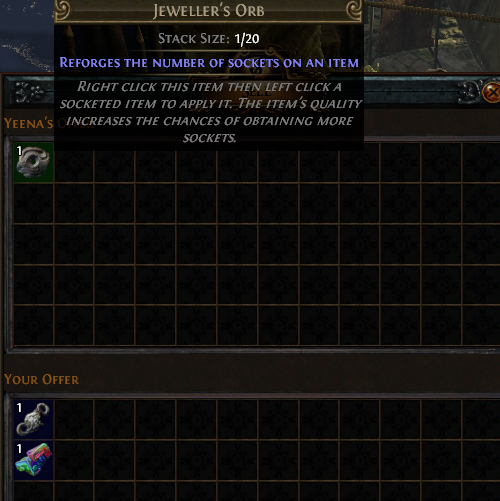 In the player market, Jeweller’s Orb to Chromatic ratio is 1:1. A set of 5 Emperor’s Luck divination cards exchange for 5 PoE Currency randomly. Vaal Orb corrupts an item and modifying it unpredictably. If you want to change the color of a white socket, using Vaal Orb and the result is unpredicted. When Vorici is level 8, you can use the “Artisan’s Bench” to change sockets and links of a corrupted item.